With a fridge full of peaches that were ready to be eaten, I had to find another way to use them up. (My personal favorite is to cut up the peaches into bite sized pieces, sprinkle with a little sugar & let them sit for an hour. Then, add a little half & half.... MMMMM.....) The addition of cinnamon to the recipe makes it perfect for fall! I definitely recommend using the parchment - I had run out, and had some difficulty with the galettes sticking to the pan. Still tasted delicious, but they weren't all pretty! Heat oven to 400 degrees and line a baking sheet with parchment paper. Coat lightly with nonstick cooking spray. Roll out each piece of dough into a 6-8 inch circle. Place 1 tbsp. of graham cracker crumbs in the center of each crust. Place approximately 5 peach slices onto the crust. Sprinkle approximately 1/2 tablespoon of sugar mixture on top of peaches. Fold the edge of each crust up and over peaches. Sprinkle each pie with a small amount of the sugar mixture. Bake 25 minutes, until pies are golden brown. Let cool 3 minutes before serving. 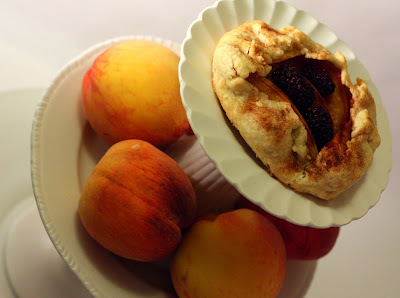 I love making galettes w/ all sorts of fruit. I like to grill peaches--yum!